Photo courtesy of Harry Rigby. 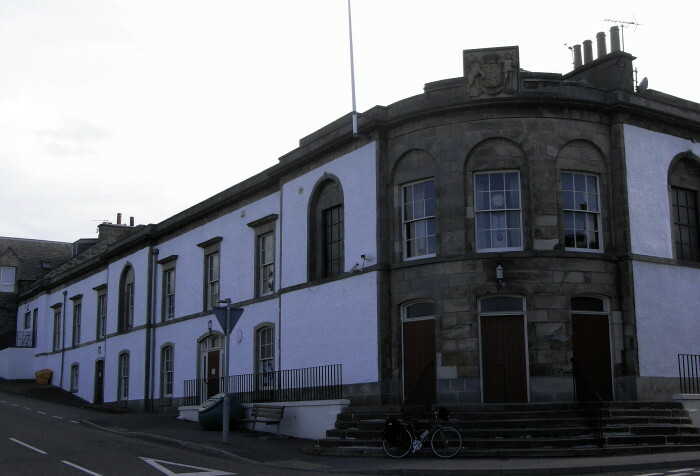 The Town Hall in Cullen (Banffshire) operated as a cinema during WW2 if not during the 30s as well. During one of these performances in 1942 the projection box caught fire (acetylene + nitrate film?) and the place was severelly damaged by the enxuing blaze. It was rebuilt in the 1950s much as before but with a lower ceiling and (wow!) electric light! This building still has a projection box it is not known if any equipment remains.